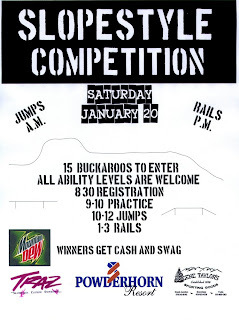 First order of business- the first Slopestyle Competition of the season is this Saturday the 20th. We'll be splitting the groups into these categories- Men's Snowboard Advanced, Men's Snowboard Intermediate, Men's Ski Advanced, Men's Ski Intermediate, Women's Snowboard, Women's Ski. It's $15 to enter and the winners get cash and swag. Everyone must sign a freestyle liability (if you haven't done so already this season). If you are under 18, a parent must sign. Just call us or send an email and we can email you a copy of the liability in case your parents won't be here Saturday. Next- we've made it even easier now for you to join the text messaging list! There are already over 150 people receiving powder alerts and special deals directly from us. To join, just text the word DEALS to 38714. You can remove yourself from the list at anytime. There is a great promo available to you right now!